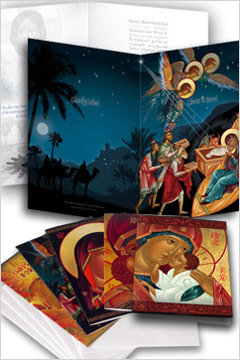 The Three Wise Men appear regularly in on Christian Christmas cards, traditionally named the Adoration of Magi. From biblical references we know that Three Kings of Orient worshiped the Nativity of Jesus and brought him gifts of gold, frankincense, and myrrh. A mystery surrounds these ancient pilgrims and there is still controversy surrounding the newly rediscovered ancient texts that mention Adoration of Magi. Though known universally through their deeds, the three Magi possess different individual names across various languages. In Western Christian traditions they were known as Melchior, Caspar, and Balthazar, names derived from an ancient Greek manuscript dating back to 500 A.D. Syrian Christians call the Magi Larvandad, Gushnasaph, and Hormisdas, names of Persian origin. Armenian Christian identify the Magi as Balthasar of Arabia, Melchior of Persia and Gasper of India. A widespread belief among sects of Chinese Christians assert that one of the Magi came from China. This idea has some historical proof due to the discovery of an ancient manuscript called the “Revelation of the Magi,” that tells a different version of the Three Wise Men’s journey to Bethlehem. What is revealing and controversial is the idea that this ancient original was written from the point of view of the Magi themselves. It was recently discovered in the Vatican archives and Biblical historians have yet to agree upon an author. It is roughly 1,700 years old. A belief held among Biblical archaeologists is that at the times of Jesus’ birth there was one road leading all the way to China was called “The Spice Route”. It was very common to see tradesmen traveling in caravans across the desert. 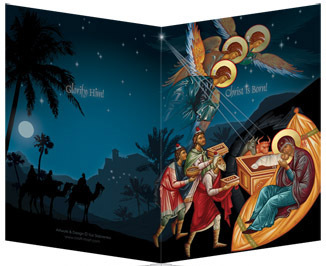 The Three Magi are commonly seen in this setting on Christian greeting cards, dawned in colorful clothing atop camels riding towards a star. According to the “Revelation of the Magi” the Three Kings are descendants of Adam and Eve’s third son, Seth, and came to worship Jesus from far eastern land called ‘Shir’. When this is cross-referenced with other ancient text the clues point to China. Adoration of Magi was and is a popular theme in all art schools: Greek, Roman, Byzantine, Italian Renaissance, Chinese, and modern art, including Christian greeting cards. Byzantine art usually depicts the Magi in Persian clothing which includes traditional breeches, capes, and Phrygian caps, as can be seen on a famous mosaic in Basilica of Sant’Apollinare Nuovo in Italian town of Ravenna. Traditions relating to Adoration of Magi differ between countries all over the word. In Latin America “Los Reyes Magos” receive wish letters from children and bring them gifts on the night before Epiphany. For example, in Puerto Rico and the Dominican Republic, children cut grass or greenery on January 5 and put it in a box under their beds for the camels. They receive gifts on January 6, called Día de Reyes, the day when traditionally the Magi had arrived (in Western Christianity) bearing gifts for the Christ child, marking Adoration of Magi. In Spain traditions each Magi is represents one continent: Europe (Melchior), Asia (Caspar) and Africa (Balthasar). The Magi come from the Orient on their camels to visit the houses of all the children, like Santa Claus with his reindeer. A tradition of Adoration of Magi in most of Central Europe involves writing the initials of the three kings’ names with the year number split around them, above the main door of the home in chalk. This is done to spread Christmas blessings on the occupants for the New Year. For example, 20 * C + M + B * 12 would be written for 2012. These initials are also believed to stand for “Christus Mansionem Benedicat” (Christ bless this house). In Germany and Austria three children, dressed up as the Magi, carrying the star and singing Christmas carols, collect money for a specific charity project in exchange for writing the initials above the door.